The Partnership for SafeMedicines (PSM), a group of nonprofit organizations and individuals dedicated to protecting consumers from counterfeit drugs, today announced a major expansion of its international coalition with the launch of its partner PSM India. 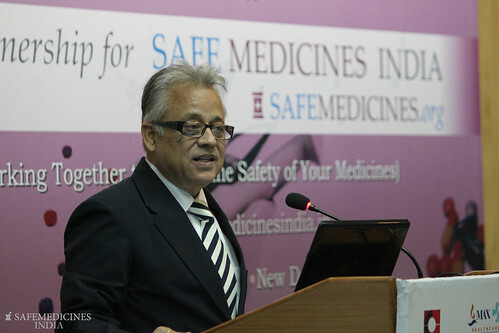 NEW DELHI and WASHINGTON, D.C. (December 7, 2010) – The Partnership for SafeMedicines (PSM), a group of nonprofit organizations and individuals dedicated to protecting consumers from counterfeit drugs, today announced a major expansion of its international coalition with the launch of its partner PSM India. The announcement, which brought together consumer advocates, industry leaders and government officials, marks the latest development in PSM’s ongoing campaign to identify and implement meaningful solutions that address the worldwide counterfeit drug crisis. Initial meetings were held in New Delhi on the 7th, and an additional meeting is being held on December 9th in Mumbai. Click here for the agenda. PSM India today also unveiled a Web site (www.safemedicinesindia.in) to help consumers, businesses and government officials access knowledge and share ideas and information on ways to strengthen regulatory processes. The Web site is also designed to empower consumers and partners. Participants at today’s launch event include Vince H. Suneja J.D., LLM, First Secretary, MAC (USDOC), Embassy of the United States of America; Devendra Chaudhary, IAS, Joint Secretary to The Government of India, Department of Pharmaceuticals, Ministry of Chemicals and Fertilisers; Dr. S. M. Jharwal, Chairman, National Pharmaceutical Pricing Authority (NPPA),Government of India and S. Krishnan, Chairman of Healthy You Foundation. As the Obama administration recently cited in its Intellectual Property Enforcement Strategy, approximately 8 percent of the bulk medicines imported into the United States are counterfeit, unapproved, or substandard, and 10 percent of global pharmaceutical commerce, or $21 billion, involves counterfeit drugs. “The counterfeit drug issue warrants a broad and international response with all stakeholders,especially law enforcement, at the table,” said Tom Kubic, president and CEO of the Pharmaceutical Security Institute (PSI). “PSM India is exactly the type of effort that is needed to educate consumers and identify meaningful solutions that apply to every nation and regionacross the globe.”Today’s event follows a first-of-its kind Interchange forum hosted recently by PSM in Washington, D.C. FDA Commissioner Margaret Hamburg delivered the keynote address.